Does it make sense for Washington to try to be proactive about its future and trade Cousins now? And, as is the case with the Oklahoma City Thunder trading for Paul George a year before his own free agency, is there a team out there bold enough to trade for Cousins in the hopes of retaining him next year?...Would Cleveland be willing to give up Houston's first-round pick and Brock Osweiler (after a contract restructuring) to try to steer Cousins away? And would Washington be willing to take a guaranteed pick and a veteran quarterback to try to move on from the Cousins era with something to show for its efforts? There you have it fellow posters. The idea is out there so we might as well discuss it.... what would you be willing to trade for Cousins, assuming there was no agreement in place that he would stay after next year? What do you think the chances are the Browns could convince him to stay ala Jamie Collins and beat out the presumed front-runners in the 49ers? One last point - even though they're different sports, let's remember the haul Indiana got for Paul George was only Victor Oladipo and Domantas Sabonis - not chopped liver but also not on the same level of what it was speculated it would take. You only make a trade for him with an extension in place. "but Bwick, they only gave up a compensatory 3rd for Collins so it's not like they gave up much if he walked"
Ok, so you're saying you would give up at most a third round pick for Cousins if the extension isn't in place. "but Bwick, the Redskins would never do that." The point of this wasn't to see what you think would be realistic, it was to see what everyone would be willing to give up with an extension not already in place. Plus, as I mentioned, when the prospect of a star player walking away for nothing is on the immediate horizon and there is discord between said player and the team (as was the case with PG and Indiana), teams may have different discussions of what the value is than the fans and end up surprising all the speculators if/when a trade does go down. One of our second rounders. Sure someone MAY offer more, but I think the number of teams that have the resources to gamble a pick AND the cap space to sign him are pretty limited. There going to be giving up more for Cousins so they might want security. 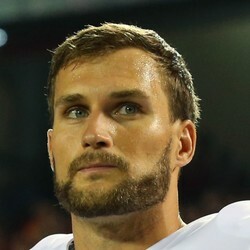 If the Redskins liked the offer for Cousins, couldn't they just allow Cleveland to negotiate a contract with him, and then have him sign it once the trade is official? This is all pure speculation so I could be wrong on any point, but my guess is it's against the rules for a team to negotiate with a player under contract with another team, even with that other team's blessing. Also, I think the deadline for any type of extension vs. the franchise tag was yesterday, even if Cousins does get traded. This doesn't mean it's impossible for the Browns to work through back-channels to get some type of behind-the-scenes verbal agreement for an extension, but there's no point in using that as basis for a conversation since we could never confirm the deal's existence. After giving it some thought, I think I would bet on Cleveland being able to sell Cousins and take the gamble - I'd offer Cleveland's 2nd rounder (most likely the highest of the three) and Brock Osweiler on a restructured contract (where the Browns ate some of his remaining salary). That would probably be the best deal Washington would get, and as for Cousins, we have more offensive weapons than San Fran, a better o-line, and more resources to better the team with young talent in the immediate future as well, plus the cap space to pay him. I think it's a win-win-win for Washington, Cleveland, and Cousins. I don't think Wash would take Brock and a 2nd. I don't think they would take Brock and 2 2nds... They would want both our 1sts, brock and a second for Cousins. Plus I would not trade anything for Cousins without a long term deal in place. With Cousins I doubt we win enough games to make it to a dark horse team in the running for the 6th seed so it would be a waste of picks. He's playing the waiting game until he can go play for Shanny again. He, and Jimmy Garoppolo, will both end up with new teams next year, and both will use the Browns as leverage to get to their preferred destinations (SF for Cousins, WAS for Garoppolo) with the most coin. So you're willing to assume he would use Cleveland as leverage to drive up his price with a team he's pre-determined he'll be going to regardless (based off the worst kept secret ever), but you're not willing to assume that his representation leaked the San Fran information back in March as leverage to try to obtain an optimal deal with the Redskins? Seems like it would have to be both or neither. That being said, I'm on the opposite end of the spectrum that San Fran isn't the sole destination for Cousins were another team to make a play for him, in earnest. If Cousins is willing to build a rapport with one coach based off time spent with him, why not a second? Namely, I believe given a full season with the team, Hue would work his magic to get Cousins to buy in as he has unquestionably done with numerous players here already. Also, let's face it: money talks and if the Browns felt Cousins were worth it, they have plenty of that as well to trump what SF could offer. Not a chance. It would take a pretty good pick, and if he were to resign, he would literally break the bank. I think he is pretty good, but he is not elite, and the compensation he will demand, both draft pick and financial, would be the price for an elite QB. I say stick to the plan, keep an eye on the draft, and keep drafting at least one every year, until you strike gold. The way the draft has gone the last couple of years, and looks to go next year, I see a pattern. It won't take much longer to have an elite team in place around the QB. Once we have that, if we still have not found our guy, draft 2 of them a year until you find him. You make valid points, but you can not deny he has a very punchable face. I rest my case, your honor.